In an audiotape, Egypt’s military chief talks about his dreams, saying that in one nighttime vision he was brandishing a sword and that in another he told the late Anwar Sadat that he himself would be president one day. The tape, apparently leaked by opponents to embarrass the general, kicked off an online storm of parodies and mockery. But to most Egyptians, among whom dream interpretation is commonplace, it only deepened an image of the country’s most powerful figure - and very possibly its next president - as a spiritual man, in touch with the nation’s traditions. 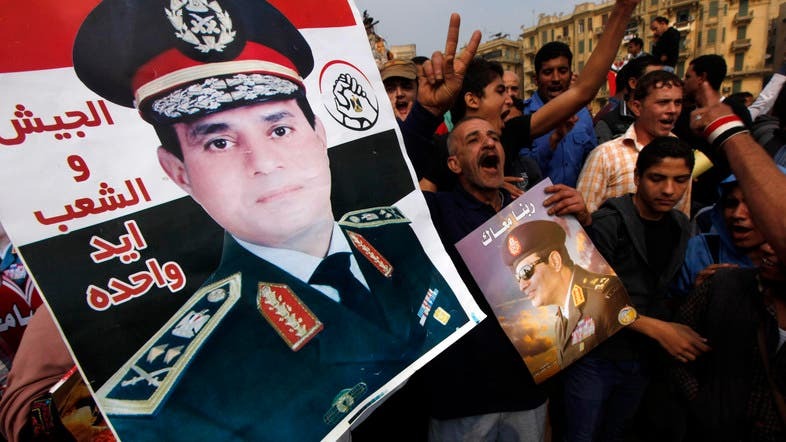 The twist illustrates the seemingly inexorable momentum for Gen. Abdel-Fattah el-Sisi to run for president in elections due in 2014, the crowning step in the transitional roadmap laid out by the military after the general removed Islamist President Mohammed Mursi from office and threw him in prison. For his supporters, he seems unable to do wrong. Since the July 3 coup, there has been fervor for el-Sisi among the public, fed by a stream of support in pro-military media but also by a yearning among many Egyptians for a strongman savior who can bring stability after nearly three years of turmoil and instability. “Apparently, those who leaked the last tape have not sufficiently studied the nature of Egyptians,” said Negad Borai, a prominent rights activist and a lawyer. New political alliances have sprung up to pressure el-Sisi to run. This week, one grouping called “Masr Balady” or “Egypt is My Country” - which brings together prominent figures, including a former interior minister and senior Muslim cleric Ali Gomaa - called on Egyptians to take to the streets next month to support his presidency. El-Sisi’s chief opponents are Mursi’s Islamist supporters, who describe the coup as treason and brand the general as a murderer for the deaths of hundreds in a ferocious crackdown on pro-Mursi protesters that has been underway since the ouster. Faced with his soaring popularity, the Islamists have been striving to cast el-Sisi as a ruthless dictator, an enemy of Islam or an agent of America and Israel. El-Sisi also faces opposition from secular activists who are worried over the power of the military and believe that if he became president it will lead to a new autocracy like that of Hosni Mubarak, ousted in the 2011 revolution. The tape, which emerged last week, was the latest in a string of private conversations by el-Sisi believed to have been leaked by his opponents in an attempt to smear him. But often the leaks have fed his popularity, making him appear a committed soldier, pragmatic, modest, religious and close to the people. El-Sisi has not ruled out a run. The latest leak, however, left little doubt in the minds of many that he will seek the job. The audio recording was from comments he purportedly made to the editor of a privately owned newspaper on the sidelines of a recent interview. On the tape, he says he began to have dreams and visions starting 35 years ago but that he had stopped talking about them in 2006. Yasser Rizk, the editor of the pro-military Al-Masry Al-Youm daily who was interviewing el-Sisi, confirmed the comments but he said they had been edited and were not in their original order - though he did not elaborate. The military has not commented on the tape. Dream interpretation is an accepted religious tradition among Muslims, mentioned in the Quran. Having visionary dreams is seen as a mark of piety. S. Azmat Hassan, a Middle East expert from New Jersey’s Seton Hall University, noted that politicians sometimes use dreams to bolster their standing. El-Sisi "will certainly gain traction among some Egyptians who believe in the significance of dreams," he said. The dream talk also fits with el-Sisi’s background. He was born and grew up in the Gamaliya district of Cairo’s medieval quarter, in the shadow of the city’s best known mosques and shrines. Soft-spoken and known to be a pious Muslim, el-Sisi has also drawn supporters with youthful looks and energy - as well as emotional catchphrases unusual for a military man that he often drops into speeches. Backers often tout that as a show of his humanity, though for others it rings of populism. “Don’t you know that you are the light of our eyes?” he said in one address to the public, using a common Arabic expression of love to show how much the military cares for Egyptians. “Egypt is the mother of the world and will be as great as the world,” he often says to assure people that better days are to come. Over the past months, a string of leaked videos and audiotapes of el-Sisi have been posted on pro-Brotherhood websites, claiming to reveal his unsavory side. In one example, he tells a private meeting of officers that people using mobile phones should pay for calls they receive as well as the ones they make. In others, he talks of the need to manipulate the press or calls for a clause in the constitution that would protect the defense minister from being removed by the elected president. Such a clause did end up in the final draft of the revised constitution that is to be put to a referendum in January, drawing criticism from rights activists who say it entrenches the military as an independent political power, unaccountable to the civilian leadership. Yet, there has not been much of an outcry from the broader public. Instead, supporters pointed to his shows of humor and compassion that also appear in the leaks. In one, el-Sisi berates an assembly of top officers for demanding perks and for mistreating underlings. He says officers should not insult or humiliate conscripts because it makes the army look bad before the public - a message appealing to many Egyptians who often complain of abuse by those in authority. Poll asks who’s more influential: Sisi, Erdogan, Netanyahu, or Rowhani?